170J4 Poly V Belt, Consumer Brand | 170-J4 Micro V Belts | Metric PJ432 Motor Belt | 17 inch Ribbed Belt (432mm) Length, 4 Ribs. Home > Heavy Duty V Belts > Poly-V Ribbed (Micro -V) Belts > J, PJ Section Poly-V (Micro V) Belts - 3/32" Rib Width. > 170J2 Poly-V Belt, Metric 2-PJ432 Motor Belt. > 170J16 Poly-V Belt, Metric 16-PJ432 Motor Belt. > 170J10 Heavy Duty Poly-V Belt. Metric 10-PJ432 Motor Belt. > 170J4 Poly-V Belt (Standard Duty), Metric 4-PJ432 Motor Belt. 170J4 Poly-V Belt (Consumer Brand), Metric 4-PJ432 Motor Belt. 170J4 Poly-V Belt (Standard Duty), Metric 4-PJ432 Motor Belt. 170J4 Poly-V rib belt. 4 Ribs. 17” (432mm) O.C. - PJ432 Metric belt. CONSUMER BRAND “J” Series Poly-V (Micro V) ribbed belts are designed to replace OEM belts on extra heavy-duty applications such as 170J4 sander/planer belts, compressor belts, 170J4 (4-Rib PJ432) fitness drive belts, and electric motor drive belts. AKA: J4-170 Belt. Bando Rib Ace (BNO) 170J-4. Optibelt RB PJ 432 (4 Rib), Rippenbander PJ432/4. Metric Poly V: 4-PJ432 (4/PJ432). 170J6 Poly-V Belt (Standard Duty). Metric 6-PJ432 Motor Belt. 170J6 Poly-V (Standard Duty) Belts: 17” OC Length: J Section Motor Belt replaces fitness belts, compressor belts, drive belts, and electric motor belts. 170J-6 Poly-V Belt. 170J10 Poly-V Belt, Consumer Brand Metric 10-PJ432 Motor Belt. 170J10 Belt (10-PJ432) Consumer Brand. 170J-10 Poly-V (Micro-V) Belts: 17” OC Length: J Section Motor Belt replaces fitness belts, compressor belts, drive belts, and electric motor belts. 170J-10 Poly-V Belt. 170J2 Poly-V Belt, Metric 2-PJ432 Motor Belt. 170J2 Belt (2-PJ432). 170J-2 Poly-V (Micro-V) Belts. 17” Length. J Section Motor Belt replaces fitness belts, compressor belts, drive belts, and electric motor belts. 170J-2 Poly-V Belt. 170J3 Poly-V Belt, Metric 3-PJ432 Motor Belt. 170J3 Belt (3-PJ432). 170J-3 Poly-V (Micro-V) Belts. 17” OC Length: J Section Motor Belt replaces fitness belts, compressor belts, drive belts, and electric motor belts. 170J-3 Poly-V Belt. 170J4 Poly-V Belt, Metric 4-PJ432 Motor Belt. 170J4 Belt (4-PJ432). 170J-4 Poly-V (Micro-V) Belts: 17” OC Length: J Section Motor Belt replaces fitness belts, compressor belts, drive belts, and electric motor belts. 170J-4 Poly-V Belt. 170J5 Poly V Belt. Metric belt 5-PJ432. 170J5 Poly V Belt. 17" Length (432mm), 5 Ribs. 170J-5 Drive Belt. Metric belt 5-PJ432. 170J6 Poly-V Belt, Metric Belt 6PJ432. The 170J6 v-rib belt. 17" Length (OC), 6 Ribs. 170J6 Poly-V (Micro V) J Section ribbed belts are designed to replace OEM belts on extra heavy-duty applications such as fan belts, compressor belts, drive belts, treadmill motor belts, and electric motor belts. 170J7 Poly-V Belt. Metric 7-PJ432 Drive Belt. 170J7 Belt, 7-PJ432 Poly-V Belts. PJ432/170J x 7 ribs Wide (5/8”). 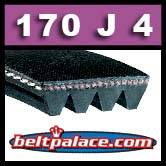 170J-7 Section Motor Belts replaces fitness belts, compressor belts, drive belts, and electric motor belts. 170J-7 Micro-V Belt. 170J8 Poly-V Belt, Industrial Grade Metric 8-PJ432 Drive Belt. 170J8 BANDO Industrial Grade Poly-V Belt. 17” Length x 8 Rib PJ432/170J Belt replaces fitness belts, compressor belts, drive belts, and electric motor belts. 170J8 Micro-V Belt. 170J9 Poly-V Belt, Metric 9-PJ432 Motor Belt. 170J9 Belt (9-PJ432). 170J-9 Poly-V (Micro-V) Belts: 17” OC Length: J Section Motor Belt replaces fitness belts, compressor belts, tumble dryer drive belts, and treadmill motor belts. 170J-9 Poly-V Belt. 170J10 Heavy Duty Poly-V Belt. Metric 10-PJ432 Motor Belt. 170J10 Belt (10-PJ432). 170J-10 Poly-V (Micro-V) Belts: 17” OC Length: J Section Motor Belt replaces fitness belts, compressor belts, 170J drive belts, and electric motor belts. 170J-10 Poly-V Belt. 170J11 Poly-V Belt, Metric 11-PJ432 Motor Belt. 170J11 Belt (11-PJ432). 170J-11 Poly-V (Micro-V) Belts: 17” OC Length: J Section Motor Belt replaces fitness belts, compressor belts, drive belts, and electric motor belts. 170J-11 Poly-V Belt. 170J16 Poly-V Belt, Metric 16-PJ432 Motor Belt. 170J16 Belt. PJ432/170J-16 Rib Poly-V Belt. 17” Length J Section Motor Belt replaces fitness belts, compressor belts, drive belts, and electric motor belts. 170J-16 Micro-V Belt.